World War has just ended with the Allied victory. A victory of measure, made possible by the support, economic-financial more than military, of the Usa, because in reality the German forces were never militarily defeated: it was the internal, economic and political collapse of the country to determine the defeat of Germany. The war, in total, mobilized more than 70 million soldiers, of whom over 9 million fell, with an average rate of 11 fallen each 100 mobilized. The estimates of civilian casualties differ much among historians, especially as they have to add up the millions of deaths of the “Spanish” epidemic that was raging in those weeks around the world, possibly causing alone twenty million victims. A notable difference however is that France and Great Britain were able to count on the irreplaceable contribution of their colonial empires, which in the English case provided even 30% of the soldiers and nearly 20 per cent of the fallen: A high price, of which the So-called Third World will begin to demand its own account during the 1919, then find final outlet in the decolonization of the second half of the nineteenth century, after a second world war. 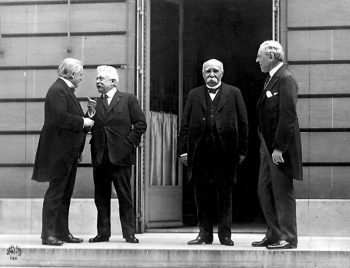 The Paris conference opens on the morning of January 18, 1919, in the Salle de l’horloge at the Quai d’orsay, in Paris. France, Great Britain, Italy, the United States of America and Japan act as “main allied and Associated Powers”, and for this they will form the Council of ten, in which the Prime ministers sit (President Wilson, in the case of the Usa), and the respective foreign ministers. Belgium, Bolivia, Brazil, Costa Rica, Czechoslovakia, China, Cuba, Ecuador, Greece, Guatemala, Haiti, Hegiaz, Honduras, Liberia, Nicaragua, Panama, Peru, Poland, Portugal, Romania, San Marino, Serbo-Croatian-Slovenian state, Siam and Uruguay, Allied Powers and Associated, will mostly be present as Comprimarie, although for example Serbia, Belgium and Romania have reported destructions and victims far superior to those of Japan. Germany is not present, as is Bulgaria, Austria and the Ottoman Empire: nations to which the conditions of peace will be simply dictated, after being predisposed by the victors. Another exemplary absence is that of Russia, Travolta in 1917 by the Revolution: After the advent of Bolshevism, it concluded with the central Empires a ruous peace, in March 1918, in Brest Litovsk, with which it lost one third of its territory and perhaps Half of its industrial potential. Ukraine, then detached from Russia, will try in vain to be recognized by the Allies in Paris as an independent nation: in this case too, it would take another world war and more than seventy years of communism before releasing Russia, to be Today instead courted by Nato, against the reborn Russian power of Putin. Despite these wastes and absences, we hastened to draw the Society of Nations, in homage to Wilson, personally detested by the great Anglo-French (and Italians…), but too useful in providing, with its fourteen points, the ideological screen necessary to sink definitively the Central Powers defeated, on the one hand; And, on the other, to counteract the rampant threat of the Bolshevik menace. Within a week, in fact, the Paris conference would have appointed the Commission to elaborate the Constitutive Act of society, destined to wreck miserably in front of the same American Congress and then with the outbreak of the second war World, which she would not have been able to avoid. However, one element is evident: With the Paris conference the American policy was overturned, up to that time alienated from getting bogged down in a Europe considered Retriva and liberticide. It is precisely from January 1919, in fact, that the United States of America had to start dealing with European politics, and they had to do so in the wake of that Democratic interventionism Wilsonian which turned them into the hegem power of the West and So in the world superpower we still know.